Summer’s end is coming, but there is still plenty of fun around. BLOCK PARTY — The Downtown Gloucester Block Party Series, Main Street, Gloucester, on Sept. 1, 6-10 p.m. Free. Main Street will be closed to traffic, so come on down and enjoy free entertainment. Live music, great food, children’s activities, contests, games, and more. Information: info@capeannchamber.com, here, 978-283-1601. 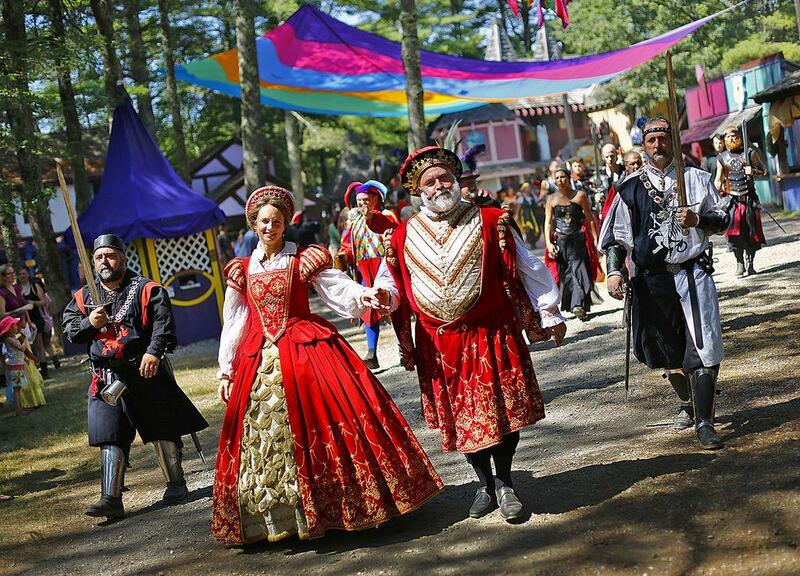 KING RICHARD’S FAIRE — Weekends, Sept. 2-Oct. 22, including Labor Day and Columbus Day. Gates open at 10:30 a.m. and close at 6 p.m. New England’s greatest Renaissance fair returns to the grounds at 235 Main Street, Carver. Information: here. KITE FESTIVAL — Onset Beach, 182 Onset Avenue, Wareham, on Sept. 2, 10 a.m.-4 p.m. Did you know that September is National Kite Month? Cape Cod Collectibles will be there with a build-a-kite station and kites for sale! Live kite flying demonstrations. GREEK FESTIVAL — at St. Anargyroi Greek Orthodox Church, 9 Central Street, Marlborough, on Sept. 2, noon-11 p.m.; Sept. 3, noon-11 p.m.; Sept. 4, noon-5 p.m. Greek food, beer and wine, pastries, dance groups and more. Free admission; rain or shine. Information: webmaster@stsanargyroi.org, here, 508-485-2575. BASS RIVER ARTS AND CRAFT FESTIVAL — Sept. 3 and 4, John Simpkins Field, 1153 Route 28 in Yarmouth. More than 75 juried craftspeople will display and sell their American- made works, including fine jewelry, pottery, scarves, quilts, photography, vintage chic, metal, crystals, sea salt scrubs, fleece, steam punk accessories, wall hangings, lamps, stained glass, candles, soap, dried floral, furniture, aromatherapy, custom signs, wearable art, folks art, pet treats and more. Come and sample specialty foods such as herbal dips, jams, jellies, gourmet cookies and more. Festival hours Saturday from 10 a.m.-5 p.m., Sunday from 10 a.m.-4 p.m. Directions: From Route 6 take Exit 8 onto Station Ave, follow to Route 28. Free Admission, free parking, held rain or shine, handicapped accessible, and friendly-leashed pets are welcome. For more information, please call 603-332-2616 or visit here. LABOR DAY PARADE — Sept. 4, noon, Marlborough. Parade begins at Pleasant and Lincoln Streets and proceeds west onto Lincoln Street, south onto Broad Street, east onto West main Street and continues onto Main Street, turns south on Maple Street and ends at the intersection of Route 85- Bolton Street. For more information, please visit here. NORWOOD DAY — Sept. 8 (fireworks) and Sept. 9. Enjoy live local entertainment, clowns, games, prizes, crafters, food, sidewalk sales, kiddie rides, business groups, and town department displays. Norwood Day Buttons will help support activities and allow for free food tasting, kiddie rides, trolleys, rock climbing and racing. Cost of buttons before event are $3 each, ($5 day of event). The parade on Sept. 9 starts at 9:30 a.m. at the library, goes through town and ends at the gazebo. Information here. DOVER DAYS — Town Green, Dover, Sept. 9, 9 a.m.-4 p.m. The fair features rides, games and activities such as moonwalk, children’s activities, demonstrations and hayrides. Bring your appetite; there will be lots of food and drinks, including hot dogs, hamburgers, cotton candy and ice cream. Items for sale include gift baskets, plants, flowers, jams and various other specialties. Once again, the Dover Dash 5K and Fun Run will take place during Dover Days. For information on entering, please visit here. CELEBRATE LAKE QUINSIGAMOND DAY — Regatta Point Park and Lake Quinsigamond, 10 Lake Avenue, Worcester, on Sept. 9, 9 a.m.-6 p.m. Wooden boat show, 9 a.m.-2 p.m.; Boat Parade, 2-3 p.m.; music and festival, noon-6 p.m. ANNUAL ART AND MUSIC MAKERS FESTIVAL — Singh Performance Center at the Alternatives’ Whitin Mill, 50 Douglas Road, Whitinsville, on Sept. 9, 10 a.m.-3 p.m. Artisans will be selling their wares and demonstrating how their unique arts are crafted. Arts and crafts, hands on art opportunities and kids’ crafts. Music by the Blackstone Valley String Quartet and other local musicians. Rain date Sept. 16. FOOD FARM & GARDEN FAIR — Concord Ag Day Farmers Market, Sunday farm tour at Verrill Farm, Hutchins Farm, Barrett’s Mill Farm, Marshall Farm, Main Street on the Milldam, Concord, on Sept. 9 and 10, 10 a.m.-4 p.m. Free. Concord will celebrate its food bounty with food that’s grown, produced, and prepared by Concord farmers, residents, and food businesses. Highlights include the Concord Ag Day Farmers Market on Main Street, Concord Center, Saturday, 10 a.m.-2 p.m., featuring Concord-only, producer-only vegetables, fruit, eggs, flowers, honey, jam and more, as well as horticultural and culinary demonstrations, live music, activities for kids, and breakfast treats and ice cream; kitchen garden tours at three Concord residences Saturday, 1-4 p.m. ; farm tours at four different Concord farms on Sunday. Full schedule and details, please visit here. AUTUMN ARTS AND CRAFTS FESTIVAL — Wayside Inn, 72 Wayside Inn Road, Sudbury, Sept. 9 and 10, 10 a.m.-4 p.m. Come enjoy this wonderful opportunity to support, and admire, local artists and the amazing dedication their skillset entails. This creativity packed event is the perfect outing for the family, with food and music on site. Some of the arts and crafts that will showcased are alpaca clothing items, crystalline pottery solar lights, books personalized by author, unique recycled milk carton lights, hand painted neckties and scarves, fine jewelry, folk art and other paintings and calligraphy, embroidery, stained glass, hand poured soy candles, quilts, kettle corn, ornaments, seasonal decor, ceramic tiles and more. Rain or shine; admission — $5 for adults, $4 for seniors, free for children under 14. Free parking; friendly, leashed pets welcome. For more information, please visit here. NATICK DAYS — Natick Center, Sept. 9, 10 a.m.-3 p.m. Natick Days is an annual festival celebrating our community by providing an opportunity for Natick youth groups and nonprofit organizations to increase visibility for the great work they do. It is a Natick tradition that highlights the work of the service organizations and volunteers that make the Town of Natick such a great place to live, work and play. Food, games, touch-a-truck and much more. For more information, please visit here. RIB COOK-OFF — VFW Post, 655 Main Street, Marshfield, on Sept. 9, noon-5 p.m. North Community Church will hold its 9th annual rib cook-off. The proceeds from the event will benefit the Marshfield Food Pantry, Marshfield FACTS (Families, Adolescents and Communities Together against Substances), and North Community Church Missions. There will be a canned food drive-raffle for the Marshfield Food pantry, for every three canned goods or $5 donated people will receive a raffle ticket. The winner will receive a football autographed by Danny Amendola, wide receiver for the Patriots. Live entertainment by Jim Sylvia, there will also be kid’s activities and a bake sale. Cost $5 to get in and $1 per ticket to purchase ribs and side dishes. STARLABFEST – EIGHTH ANNUAL MUSIC & ARTS FESTIVAL — at Somerville Arts Councilʼs ARTfarm, 10 Poplar St., Somerville, on Sept. 9, noon-10 p.m. $15-$25. An all-day outdoor party showcasing national and local bands, comedians and artists. The fine folks at Bit Bar Salem will be on hand with a pop-up video arcade (set on free play). Scott Brothers New American Meat Co. will be cooking up free food, including veggie options. Beer, wine, cider, bottled water and cold brew will be available. All ages welcome / 21 and older with valid ID to drink. Cash and debit accepted for day of show admission and beverage sales. For more information, please visit here. 19TH ANNUAL PET ROCK FESTIVAL — Wyman-Gordon Field, 244 Worcester Street, North Grafton, on Sept. 10, noon-5 p.m. Featuring live music, performances and games for kids, author signings, Pups in the Air Frisbee Dog Team, doggie massages, photos of pets, animal mascots, vegetarian food court, contests for dogs, a cat photo contest, demonstrations, exhibits, vendors, nonprofit groups devoted to animal welfare causes and more. For more information, please visit here. WALTHAM NEIGHBORHOODS FALL FESTIVAL — Waltham Public Library, 735 Main Street, Waltham, on Sept. 9, 1-4 p.m. Sponsored by REACH Beyond Domestic Violence and the Friends of the Waltham Public Library, the Fall Festival has become a family-friendly way for the Waltham community to come together for food, games and entertainment – all for free. We will have Zumba, circus acts, music, crafts, a community art project, a scavenger hunt, a chance to win prizes – and more – along with a delicious free barbecue. APPLEFEST — Sept. 14-17, Algonquin Regional High School athletic fields. Fireworks on Sept. 16 from 8-9 p.m. For more information, please visit here. COLONIAL CIDER FESTIVAL — Sept. 15, 6 p.m., Wayside Inn, 72 Wayside Inn Road, Sudbury. Come enjoy, and celebrate, America’s most beloved beverage, all while helping to raise funds towards the restoration of the Wayside Inn Cider Mill. Try some fresh-pressed cider in your commemorative 2nd Edition Stoneware cider mug, alongside the delicious traditional pig roast provided by Firefly’s, all while immersing yourself in bluegrass music by Sandy Ridge Boys. Whether you want to enjoy a beautiful hay ride around the property with our favorite horse Molly, or simply want to immerse yourself in authentic barn dancing and traditional tricks, this festival is the one for you. And if you find yourself needing to get away, take a one-of-a-kind tour of Henry Ford’s cider mill, gristmill, and apple storage cellar. Tickets are $65 per person, plus addition charges through purchasing online here, or call 978-443-1776 for more information, and to make your reservations. ASHLAND DAY — Sept. 16, 9 a.m.-4 p.m., Stone Park, 73 Summer Street For more information, please visit here. MEDFIELD DAY — Sept. 16, 9 a.m.-3 p.m., 26 North Street, Medfield. The event consists of more than 150 booths highlighting Medfield businesses and organizations. To add to the fun, we have an entertainment stage and Kids’ Alley filled with rides. This is the social event of the year for Medfield residents, now in its 38th year. For more information, please visit here. HOPKINTON FAMILY DAY — Sept. 16, 2-9 p.m., Hopkinton High School, 97 Hayden Rowe St. Join us for family fun for all ages! Amateur Woodsman Competition, live entertainment, food trucks, inflatable fun house, dunk tank, games and contests, scavenger hunt. For more information, please visit here. GREEK FEST — St. Mark’s Greek Orthodox Church, 340 Calpboardtree St., Westwood, Sept. 16 from 11 a.m.-10 p.m., Sept. 17, noon-8 p.m. Kids’ Corner, music, vendor village, Greek food and more. Free parking at Westwood High School on Nahantan Street. For more information, please visit here. WESTWOOD DAY — Sept. 22 and 23, grounds of Westwood High School. The event kicks off on Friday evening with a Westwood Wolverines football game followed by a fireworks display. On Saturday, the crowds come out for a full day of fun. This unique community event has something for everyone with a 5K road race, car show, vendor village, two stages featuring local talent, food court and much more. For more information, please visit here. DEDHAM DAY — The Friends of Dedham Recreation and the Friends of the Dedham Pool will hold their 27th annual Dedham starting at noon at John Barnes Memorial Park. There will be a barbecue, games, rides, crafts, shows and music. There will also be the annual Memorial Cow Flap. A field will be divided into 3,000 individual deeded one-yard squares. Deeds will be sold at $10 per square. First prize $5,000, second prize $2,500, third prize $1,000 and fourth prize $500. At 2 p.m., Juliette the cow will be led onto the field. The first plot that she fertilizes will earn first prize, second plot gets second prize, and so on. For more information, please visit here. TOPSFIELD FAIR — Sept. 29-Oct. 9. Music, animal displays, demonstrations and the Great Pumpkin contest. For more information, please visit here.